As curious people who love to learn, the idea of jumping into the deep end of the pool and learning about various businesses is very satisfying. After we wrote about Aaron Draplin this week on Day 89, we realized that we had not yet posted about Jim Coudal, founder of Coudal Partners, and the creative force behind Field Notes, Layer Tennis, and The Deck. 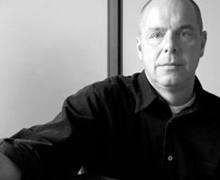 It’s about time that we give the man his due as an early forerunner of design entrepreneurship—he started Coudal Partners back in 1994, after leaving his position as creative director at a Chicago ad agency. When Coudal Partners was first getting it’s start, they had a pretty popular website, but Jim readily admits that they didn’t know what they were doing. They just learned and adapted. Their first project, Jewelboxing, a short run dvd and cd packaging service for creatives, and their second project, The Show, which recorded and manufactured limited-edition recordings of live concert performances, both called for extensive back-end packing and shipping operations—so they built in their own. They realized that to get reach a larger audience for Jewelboxing, they would need an ad network, so they built The Deck. Jim said, “It started as much as a way for us to advertise our products as it was to create an ad network. Now there are 55 services and sites in The Deck and we serve up 100 million ads every month for advertisers like Neenah, Adobe, and Microsoft.” Like many of our contributors, they solved a problem in their own life which often ends up solving problems and creating opportunities for yourself, and others. We love Jim’s story about his collaboration with Field Notes. He said, “We had all this capacity for packing and shipping and we are always looking for another product. Aaron Draplin was doing a series of goofy notebooks for all of his friends, and when we got his present, we took one look at it and said, ‘Well, this isn’t so goofy.” They didn’t talk the idea to death (one of Jim’s mottos) and moved quickly on the partnership. They took an ad out on The Deck, and now Field Notes is in 300 stores, with thousands for sale online, and they’re growing.